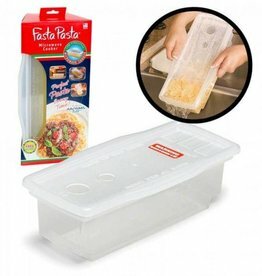 Measure, cook and drain pasta all in one container. Cook al dente pasta, vegetables, potatoes, soups, casseroles, rice, and even cakes in the microwave! BPA free and FDA-approved materials. Dishwasher safe. Made in the USA.